With so much information out there about gut health and the role it plays in weight loss, it is sometimes hard to wrap your head around fact from fiction. Resident dietitians at Peninsula Sports Medicine Group, PPN (Peninsula Physical Health & Nutrition), share their insights into this topic and how to improve your gut health. The microbiome is a collection of bacteria that lives in the digestive tract that is critical to health and well-being. A symbiotic relationship exists between gut bacteria and host, where they both benefit from one another. The gut microbiota can contribute to insulin resistance, low grade inflammation, fat deposition and therefore indirectly participate in the onset of obesity and metabolic diseases. The microbiome is established shortly after birth and determined by many different environmental factors, including natural vs cesarean birth. By the age of 2-5 most children have a full adult ‘set’ of gut microbiota, which weighs about 2kg! A healthy balance of gut bacteria is crucial to health and well-being. If an imbalance is present, individuals can be more susceptible to illnesses and have issues managing weight. A balance includes diversity. The more diverse your gut microbes are, the more likely you will be healthy, however, the more sparse or limited your gut microbes are, the more likely you are to be unhealthy or overweight. Studies in mice have shown that when gut bacteria from genetically engineered obese mice were fed to germ free mice, these germ free mice put on weight over a two week period, despite eating less. This bacterium has been identified as firmicutes, which is efficient at extracting energy from food and fibre, and also increased the absorption of fat. This shows that the presence of certain strains of gut bacteria, can determine the likelihood of someone being overweight or of a healthy weight. While it is very important to ensure that we have adequate ‘good’ gut bacteria in our digestive tract, it is just as important to make sure that we feed these bacteria adequately. This is done through the consumption of prebiotics, non-digestible carbohydrates that trigger the growth of good bacteria. Foods that are high in prebiotics include onion, garlic, leeks, artichokes, stone fruit, watermelon, dried fruit, barley, rye, wheat based products and legumes. Eat as many wholefoods as possible. 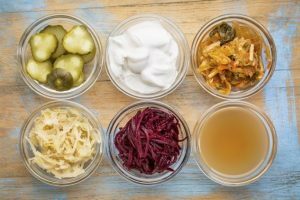 Eat fermented food – yoghurt, kimchi, sauerkraut all contain good bacteria needed for the gut. Decrease alcohol and sugar. Avoiding these for two weeks will improve gut performance and weight loss. Eat fibre rich food after a junk meal. Fruit, veggies and wholegrains help to replenish good bacteria that have been wiped out. The Mediterranean diet is the best diet for gut health and weight loss. To learn more about health and nutrition, call your local clinic to book an appointment with one of our PPN dietitians!